So many people ask us about dining packages all year long and we have never really had much to talk to them about during the warmer months. That has changed. We now have not one, but two fantastic dining packages that will be available all season long. 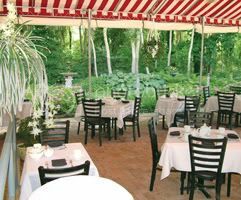 Two of our favorite restaurants, the Washington Inn and Merion Inn, have put together special menus/packages for us this year that we’re very excited about. I think you will be too! The Washington Inn has created a special package called “Cape May Uncorked”. This 3 course wine pairing dinner is being offered exclusively to Queen Victoria guests every night of the week. Each delicious course is paired with a glass of wine to create a perfect dining experience. This very special package is only $100, tax included. The Merion Inn has also created a special dining experience for guests of The Queen Victoria. Last year they introduced the “Taste of Cape May” menu for us, which they have updated for 2012. Hundreds of our guests enjoyed this spectacular 3 course dinner at the Merion Inn for only $100, tax & gratuity included. This is a seriously good deal! If you’re looking for a great “dining package” for your next visit to The Queen Victoria, we’ve got you covered. Both of these packages are exclusive to The Queen Victoria, and can only be purchased from us. Are you looking for an exciting way to kick off spring? On the weekend of March 30th over 150 musical acts will be performing in 16 different venues all over town for a weekend of fun and music. This annual event has been growing and getting better every year. Singer/Songwriters from all over the country will be converging on Cape May to show off their talents and hopefully get discovered. To top it off, all but two of these performances are absolutely free to the public! We’ve still got a hand full of rooms available for this fun weekend. If you love music, I can’t think of a better way to get the new season started. Give us a call to make your plans today. Spring doesn’t officially kick off in Cape May until Spring Festival, of course. Sure, we have to wait about a month for that to happen, but it is worth the wait. 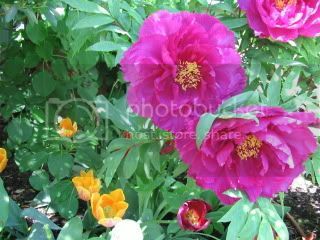 Not only will all our late-blooming spring flowers be showing off all their finery (like our beautiful tree peony pictured above), but there are lots of wonderful activities and events throughout town. We don’t have many rooms left for Spring Festival, so don’t hesitate. Remember, “He who hesitates is lost”. What, more music? Can there really ever be too much music? I think not. Especially when we’re talking about the world class musicians that descend upon Cape May each May for our annual Music Festival. It would be impossible for me to overstate the quality or the diversity of the music that fills Cape May during the music festival. From the classical to the classic, the 23rd Cape May Music Festival offers a feast for every musical taste, including orchestra, chamber, world traditions, jazz, country/R&B, beloved classics and even a few intriguing new sounds. Alan R. Kay and the New York Chamber Ensemble are returning for their annual chamber series and the Bay-Atlantic Symphony, under the baton of principal conductor Jed Gaylin, returns as the orchestra-in-residence. Unlike most music festivals, which jam all their music into a single weekend, ours is spread out over nearly 3 weeks, giving you some flexibility on scheduling your reservation to come and experience it. The Queen Victoria has long been a proud sponsor of this wonderful event and we have some complimentary tickets to share with guests visiting with us for this event. Ask us about them when you make your reservation. · Is Sustainable Energy Achievable? On May 19 Cape May Forum is also hosting the “Race at Cape May”, a re-creation of the famous 1905 automobile beach races in Cape May between Henry Ford and Louis Chevrolet. This time, though, the latest hybrid and electric cars from Ford and Chevrolet will be racing down Beach Avenue. I can’t wait! Welcome to our new CHEF! Over the years we’ve had quite a few cooks who have done a fine job preparing breakfast & tea for you. We’ve never had a chef before, though. This month Anna Marie and I hired Chef Bill Walters to join our team. Bill brings 30 years of experience to our kitchen, which was evident from his first day. Everything Bill touches looks and tastes better than it ever has before at The Queen Victoria. We are so excited. 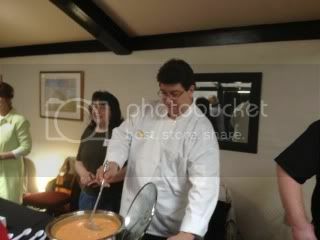 Before his first week at the helm was over Bill entered and won the 2012 Cape May Chili & Chowder Challenge (pictured above). His “Roasted Red Pepper Crab Chowder” obviously impressed the 400+ attendees who placed their ballots for their favorites. Bill’s chowder WAS excellent. Who knows, maybe we’ll serve it at tea on some cold winter day next year! We’re very excited about having Chef Bill on our staff and we’re sure you’ll notice and appreciate the difference during your next visit to The Queen Victoria. Carriage House Cafe & Tearoom … Re-Opening! Last fall the Mid Atlantic Center for the Arts & Humanities (MAC) made the shocking & surprising announcement that the Carriage House Tea Room would be closing earlier than normal in 2011. For many long time visitors to Cape May this was very sad news, indeed. In fact, quite a few people took the time to write MAC and express their disappointment over this decision. 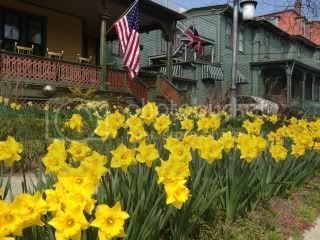 Though there was never much doubt that some type of dining facility would re-open in the Physick Estate Carriage House, the recent announcement that MAC would be re-opening the restaurant themselves was very welcome news to me. To be honest, as much as I loved the old format Tearoom, I’m really excited about the New & Improved plans for the Carriage House Cafe & Tearoom. Yes, the original and very popular Tea Luncheon offering remains. If you loved it before, you’ll be thrilled. What’s new is a menu rife with exciting new offerings and combinations, all at value pricing. Paninis, Quiches, Wraps, and Signature Salads, all at affordable prices, make the Carriage House Cafe a “must do” for your next trip to Cape May. The Grand Opening of the new Carriage House Cafe & Tearoom is coming up quickly on April 26th. I think it is going to be a big event! Picture yourself enjoying an afternoon glass of wine on our front porch. You have everything you need in life to be happy: wonderful company, scenic beauty, beautiful weather, a great glass of wine … Wait, you’re missing something! You need a 5 cheese Artisanal cheese platter. Luckily, you can now get one at The Queen Victoria. 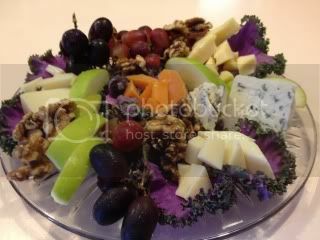 Give us 15 minutes and we’ll give you a cheese tray that will perfect your afternoon. It is also perfect for an alternative lunch or light dinner after a few days of too much eating. Better yet, order one to be waiting in your room for your arrival and you’ll have the perfect start to your visit to The Queen Victoria. Only $25. So you’ve arranged to have flowers in your room upon arrival before. Sure, she loved them, but isn’t it time to try something new? Why not arrange to have something truly special in your room this year? Chef Bill will hand dip a dozen luscious, fresh strawberries in dark, white and swirled chocolate just for you. This visually stunning and incredibly refreshing & delicious masterpiece will be a very special touch for your visit that you’ll never forget. This time give her/him something that you can enjoy too! Only $45. Spring arrived on our calendar this week, but I’ve got to say that here in Cape May the calendar is a little behind the season itself. Everywhere I look Cape May is in full bloom. 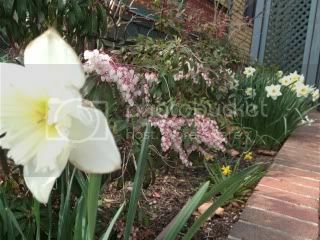 At The Queen Victoria that means daffodils, hyacinths, crocus, lenten rose (helleborus), andromeda japonica and several others are blooming beautifully … and smelling good. All of our shrubs and trees are showing sure signs of life too. Speaking of sure signs of life, we’ve been really busy here in Cape May. With all these beautiful days we’ve had lots of spontaneous visits occurring almost every day of the week. I really love spontaneity! Imagine it, you sitting on our beautiful sunny beach in our new beach chairs in March or April. It could happen … if you are the spontaneous type. Are you looking for a bright, cheery, large room for your next visit to The Queen Victoria? Who isn’t, right? I suggest you check out the Windsor room. Windsor is large 3rd floor room in the Queen Victoria building. It has high ceilings and windows on three sides, so not only is it roomy and bright, but it allows for wonderful cross breezes if you fancy a little fresh air. Windsor is also a quiet, private room. There are only 2 rooms on the 3rd floor of the building, Windsor and Buckingham, so it is unlikely you’ll see anybody anywhere near your room. Another bonus with the Windsor room is the seating area which contains a comfy love seat and a faux fireplace (electric), which doubles as a TV stand. This really is a great room. I think you’ll like it. The last time I wrote you I featured our BIG 2012 package called the Winter Escape. I must have been pretty persuasive, as we’ve sold about 150 of these packages already this year. Luckily for you, just because winter is behind us now, doesn’t mean that the package is history too. We haven’t really renamed it, but we have changed it a little bit. 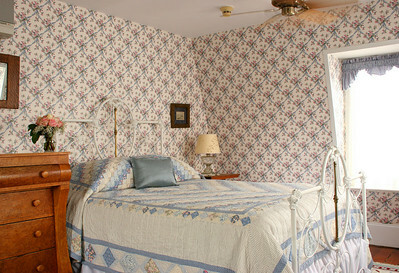 Come stay with us for any 2 week nights (Sunday through Thursday) in a Premium room, enjoy a free wine tasting for 2 at Cape May Winery, a free dessert at Lucky Bones (with the purchase of dinners), and a $5 discount on one of our magnificent new artisanal cheese trays (to use with your wine tasting) for only $295. This package is good through the end of April, valid on stays starting Sunday through Wednesday any week. One of this winter’s biggest repair projects was the rebuilding of the wall in the Prince Albert Hall stairwell and the redecorating of the entire downstairs hallway, and a portion of the upstairs landing. It is a big project that is actually still under way, though most people would never notice. First we had to tear the plaster wall down all the way up the stairwell. 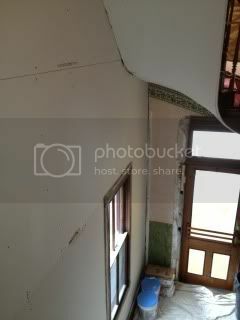 The next step was to put up drywall in place of the plaster, which you can see in this photo. Since the wallpaper could not be hung for over a month (it had to be custom ordered), we primed the walls with a tinted primer to make it presentable in the interim. The next & final steps are to remove all the wallpaper in the hallway downstairs and part of the upstairs and hang the new wallpaper. The entire project is scheduled for completion in mid-April, which can’t come soon enough for me. It will be a very different look, which I think you’ll really like. I sure hope so! Believe it or not, this will probably be one of the last times I feature this segment in my newsletter. If progress continues as it is, then this series is about to end. Maybe that is a good thing. 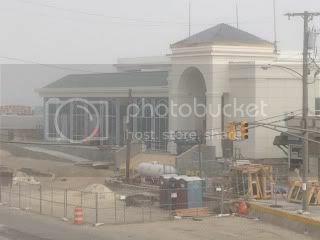 It was obviously quite foggy when I took this a few minutes ago, but you can see that things are really taking shape at the convention center. Most of the glass is in now, and most of the exterior surface is also complete. If you look closely you can see that the stairway, now covered in wood, is in, as is the handicap ramp. I was a little surprised how high above the promenade the building was. I found a video tour of the building that was filmed about a month ago (see the link below) and in it you can see that tremendous progress has been made on the interior as well. If I had to guess, I would say that finishing work is already under way inside. There has been a little controversy over pricing for use of the new center as well as the limitation of certain activities (community roller skating seems to be the most emotionally charged for some reason), but all in all progress on the convention center seems to be right on track. I’m certainly anxious to see it up close and personal when it opens. What a great photo! 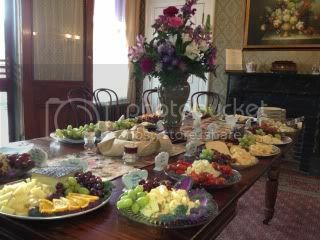 This was taken a couple of weeks ago during our annual “Big Cheesey” cheese tasting party. It is a great photo of the spread before anybody dug into it. We had 19 different cheeses of all different types from all over the world. It was a great event and everybody had a good time. The wine that everybody brought to the event may have contributed to the general merriment of all in attendance. Wow, that was really easy. It also sounds like it should be a good show. At first I was thinking we’d get some cool Jazz, which we may. I’m not sure what a symphony of friends looks or sounds like, but I guess I’ll be finding out in May. See you there. Gecko’s re-opened for the season last Thursday and Anna Marie and I made sure we were there to enjoy one of our favorite restaurants in Cape May. We had been looking forward to it since they closed for the season last October. Gecko’s is a small Southwestern style restaurant located on the back side of the Carpenter Street Mall, just steps from the Washington Street Mall. Let me tell you, this is NOT Taco Bell. Sure, you can get a burrito or enchilada, but why not try the Mesquite Grilled Salmon, Chile Rubbed Rib Eye, or Duck en Mole Verde de Pepita? Gecko’s is open for lunch and dinner and most of it’s tables are outside, though they have the ability to enclose them during the sometimes chilly Spring days. If you like Southwestern cuisine, then you MUST go to Gecko’s during your next trip to Cape May. You’ll thank me for this recommendation.